Before we get started, I'd like to say that the free download pattern in the entry below is a quilt designed by Cherri House of Cherry House Quilts. I'd feel badly if she didn't get credit for that beautiful work! Now, for today's post, I'm not really the type to make New Year's Resolutions. And, I'm definitely not the type to keep them! However, when Lindsay dare's me to do something I almost always fall for it, especially if it's at all competitive. 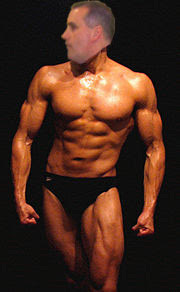 As you long time followers know, I have been trying to lose a bit of weight, be healthier and get in shape. Well, I've been a little bit successful, but then I hit that dreaded plateau. Lindsay has been trying to do the same thing, off and on, since I've known him. In the past we have had little competitions, along with support and encouragement from each other when we're being nice, or taunting and teasing from each other the rest of the time. Maybe you remember this photo? So, I was on the phone with the infamous Lindsay Moore yesterday. We were relaying how well we've been doing with our current workouts when we both admitted we'd been eating horribly. With this admission, a new competition was made and we thought it would be fun if you joined us! You cannot eat the following items (and just for Lindsay, you cannot swear), if you do, you have to donate $5 to charity (we have a pot down at HQ that will be donated each time it gets full). This is a strictly "On Your Honor" competition. No cheating, your honor is worth more than 5 bucks! Instead of weighing in every Wednesday, we will give you our current total and of course have a prize giveaway! If you would like to edit this list by adding your particular weakness (you'll notice Lindsay has my chocolate addiction covered) feel free. If you would like to remove anything from this list you are cheating! Hi everyone... I got an email this morning telling me about this awesome quilt pattern using our Hey Sugar fabrics. 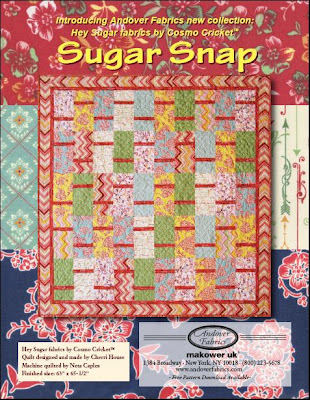 The quilt pattern is called Sugar Snap and you can download it for free using the link at the bottom. Need some sources for the fabric...on Quiltshops.com I found that several shops are carrying Cosmo Cricket's Hey Sugar fabric line. They are also carrying the fabric line at Fabrics.com, as well as at Equilter.com. Lots of great fabric, and lots of great places to purchase the Hey Sugar Collection. I hope you will enjoy this free pattern, it is so quick & easy, you could easily cut out the fabric one evening, and sew the top the next. Not only would this quilt be perfect for some sweet little one, but it would also make a great charity quilt pattern. Hello everyone! Krista here... Julie is on vacation and I hope she is getting some well deserved R & R.
Today we are featuring a great kit from Studio Calico featuring our Jack's World paper, die cuts and black board shapes. What an awesome kit! Here are a few examples of what can be done with this kit. I love the little monkey! Also, if any of our other customers out there are featuring our products in an upcoming kit or project, we would love to hear about it. 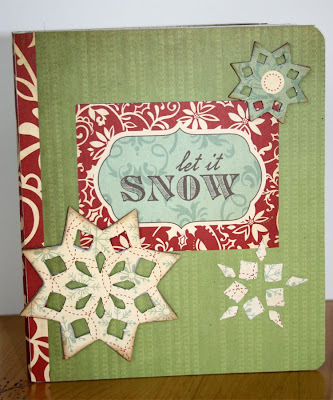 Please email me at krista@cosmocricket.com and we may feature your projects on the blog! Well, it is finally Christmas Eve. I am still putting the finishing touches on some very large scale thrifty gifty projects. I have three stockings left to sew. About 5 or 6 presents left to wrap. A gingerbread cake to make and then I'm all done! After the big day, our family is taking a bit of a break from all things other than family, so Lindsay and Krista will have to entertain you all. If you know Lindsay, this means prizes. And, if you know Krista, this means better projects than I would ever make! Really, as I think about it, I think they have ulterior motives encouraging me to do the blog. I suspect they think they are keeping me out of trouble or something. Oh well, today you're stuck with me! So, here is my Christmas newsletter reviewing the major events in our family last year. It is meant to be sung to the William Tell Overture. But, I won't torture you with my rendition, you'll have to sing it yourself. We had a great Christmas with lots of cheer. I got a road bike for my hubby dear. He got me a necklace that I always wear. Then came January, it was so very cold. It snowed everyday which got very old. Eric borrowed Lindsay's car and almost rolled. But he's safe and sound, I don't think he told. February was the same as the month before. More snow and cold it had in store. We went to CHA on the western shore. Our new lines sold even more and more. But in Providence that would not be true. My mood declined which was something new. Vitamins made it better...... after a few. Then April came and my Jack turned three. He refused in the potty to poop or pee. And the temperature was about 23. When the sun was out and the kids could play. Till she split her chin and chipped three teeth away. When they stitched her up, though they were quick. To Ethan's class for his maturation clinic. The wading pool was a flop due to more snow. In need of a diversion we went to bowl. Through her left eye, since she was a baby. And Jack finally learned to use the potty. In August, Kate went from eight to nine. Everything in her life is going fine. She has more friends than were ever mine. When she turns sixteen, the boys will get in line. With September, the kids went back to school. 15 years of marriage seems pretty cool. With Cosmopolitan magazine we had a duel. They told us that we were breaking their rule. October came, along with Halloween. We had the cutest kids that you've ever seen. And the Grim Reeper wasn't even a little mean. With November we will end our song. I'm sorry it's gotten just a little long. Our turkey was delicious, I didn't cook it wrong. We served it up, not even owning a tong. We have been very blessed as you can hear. Each and every one, throughout the year. Do you ever just want to make a wrapped package so special that the person getting it knows even before they open it that they are special to you? Well, I have a hard time spending money on expensive papers and bows, although I do love them. So, I decided to borrow my friend Melanie's idea. Here's what to do. Go to your photos and find the perfect one. In my mind this means it is an embarrassing photo, a photo that the recipient has never seen before, a photo that is a clue to what's inside or a special photo that you love of the person. Take these photos and either scan and print or go have color copies made. Then add them to your inexpensively wrapped gifts. 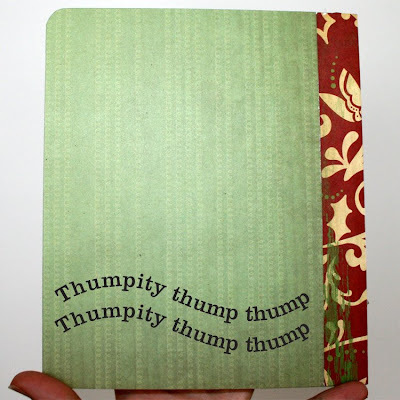 I like to add a little sentiment to make the lucky gift getter smile! 4. Glue the pie pieces together on the #2 circle and draw stitches on them. Print off chores on white cardstock, cut out and glue on... I also used Jacks World rub-ons around the circle. 5. 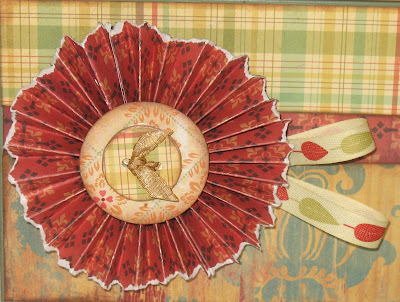 Cut an arrow out of cardstock or chipboard, using a brad put it in the center of your chart. 6. 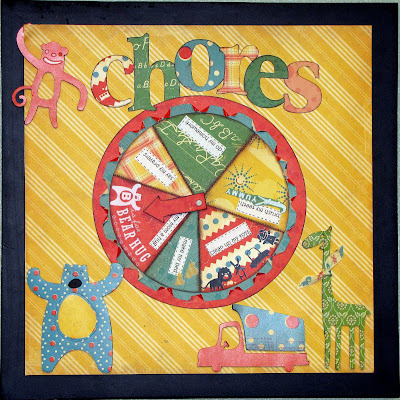 Adhere the "Chore" circle on the largest circle and glue both of them to the background paper. 7. Choose your blackboard shapes and adhere the die-cuts to them. 8. Glue them around your Chore circle. 9. Cut out "CHORES" and adhere them to the top. I hope these instructions make sense. 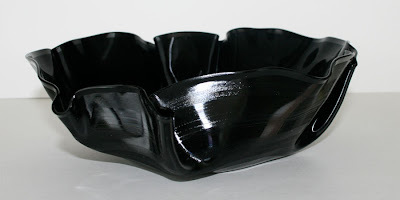 I should have done a tutorial with pictures but I wasnt on the ball and I didnt take pictures as I was creating. You will just have to try to figure out my instructions by looking at the picture! The question on everyone's mind when Kate got home yesterday was, "Did you give Zac your note?" We all waited in anticipation, but to our surprise, she said, "No, and it's too late now." Then, she says, completely seriously, "Mom, he has a BIG crush on me." I asked her if she had a big crush on him and she replied, "I think I have a small crush on him." So there you go. She just isn't committing yet. He can't win her with one cute poem. He's going to have to work at it to steal her heart completely. it's going to be a roller coaster! Yesterday, I was at the warehouse fumigating all our employees with the smell of spray paint as I worked on some Christmas projects for my kids. When I got home, Kate was very excited to see me. Kate is my oldest daughter and the child who's personality is most like my own. She says, "Guess what Mom! Zack left another note in my desk today." Let's back up here for one quick second. Zac, a poor, apparently smitten boy has come up in conversation in our home before. A few months back he left a secret note in Kate's desk telling her that he loved her. Of course, the rest of the class let Kate in on who her secret admirer was. And, not being a shy girl, Kate walked right up to him, note in hand and said, "Please explain." Zac, not knowing what to do ran away. I hadn't heard about him since until yesterday. So, back to the story. Kate continued, telling me what the note said. "Roses are red, Violets are blue, Do you like me? Because I like you!" It was signed "Your Secret Writer." This time Kate didn't do anything to embarrass Zac, which I was glad for since we had talked at length about how she had probably humiliated him the last time. But, after lunch there was a second note that said, "Are you going to respond? Your Secret Writer." Then, Kate proceeded to read me the following letter, which I have scanned for you amusement. 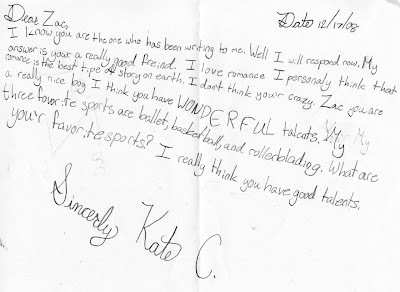 You can click on it to see it larger, but it says, "Dear Zac, I know you are the one who's been writing to me. I will respond now. You are a really good friend. I love romance (try to keep a straight face when your child reads that to you). I personally think that romance is the best type of story on earth. I don't think you're crazy (I'm not sure why she thought it was important to include this observation). Zac, you are a really nice boy. I think you have WONDERFUL talents. My three favorite sports are ballet, basketball and rollerblading. What are your favorite sports? I really think you have good talents. Sincerely, Kate C.
What's almost as funny as the letter, is Eric's take on it. He doesn't think Kate is very clear at all about how she feels about Zac. He thinks this is the beginning of man's misunderstanding of women. Why, he wants to know, does Kate not just directly say exactly what she feels. "What is Zac suppose to make of this," he asked me, "It's like she's given him a little bit of hope just so she can toy with him some more." Maybe looking into Kate's world, Eric will learn to understand all women better. Is Kate in love? Is she trying to let Zac down gently? Is she afraid of admitting she likes him too? What do you think? Well, according to Cath Edvalson anyway. 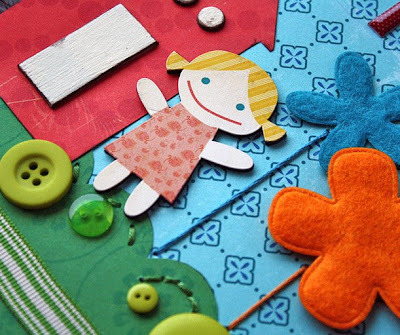 Cath is not only a really nice person, but the creative editor for Paper Crafts magazine. I love her! Anyway, she has a blog called Moxie Fab World where she features products and designers she thinks are Moxie Fab. Last week, she emailed and asked if she could interview Eric and myself. Being totally flattered, I said, of course....... who doesn't want more publicity, right? And, Cath is so nice, you'd do just about anything for her anyway. So, pop on over if you'd like to read more about us and our creative process. Oh, there is a giveaway if you leave a comment there, too! 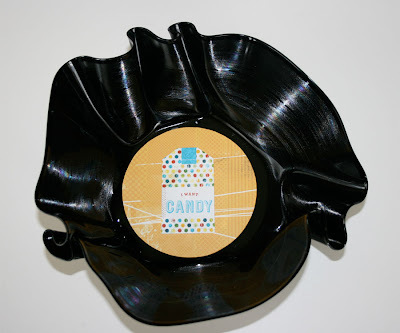 PS: In reference to yesterday's post, I was asked if melting vinyl records gave off any fumes. I can tell you there is a slight smell when you open the oven, but it isn't strong at all and disepates quickly. I didn't even get a little high! 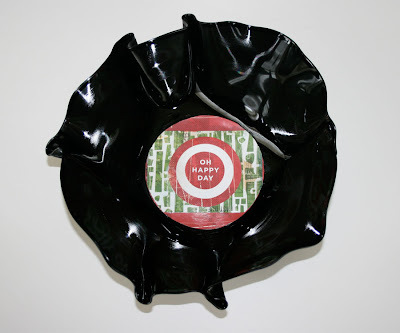 One more thing, when vinyl is warm and flexible, you can cut it with scissors. In the past I have even made bracelets out of it. For .25¢ (at my thrift store all albums are .25$, even the ones with two records in them). If you are as old as I am, you know that leaving a record out in the sun makes it warp. Well, take that knowledge one step further and you can make really funky, artsy, hip gifts for friends and family. 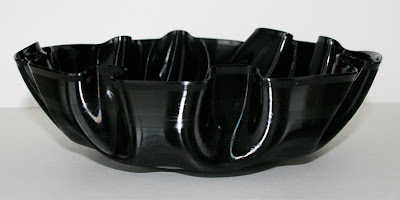 These are fabulous for treat bowls, New Years party decor, catch-alls for your teen's rooms, etc. 1. Go to your local thrift store and pick up some old records. WARNING: If, by luck, you happen to find one labeled Blue Note, do not melt it. 2. Preheat your oven to 250 degrees. 3. 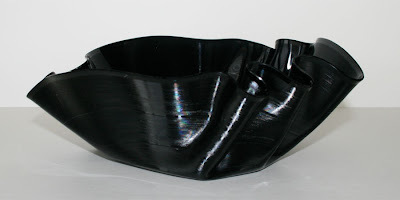 You have a couple options now, for more artsy, funky shapes, take a small salad bowl (all bowls need to be over proof), place it upside down on a cookie sheet. Then, put the record over it, put it in the oven and wait for it to melt. 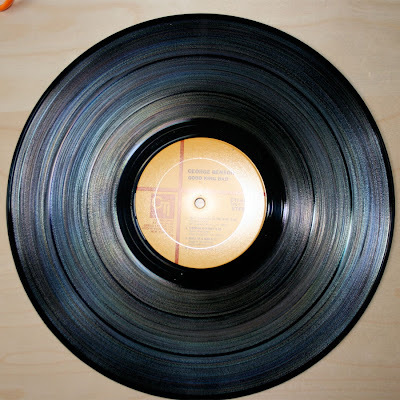 When you take it out, the record will be pliable and you can play with the design a bit. However, if you want a more uniform, perfectly round bowl, take a large salad bowl and keeping it right side up, place a record over it. Put this in the oven with the smaller salad bowl. Wait for it to get hot. 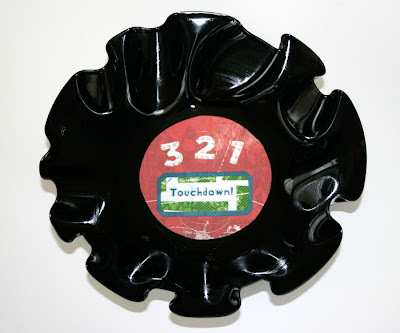 Take them out and before they cool, push the record down into the large bowl with the smaller bowl. Wait for them to cool before handeling..... not just so you don't burn yourself, but because the record will reshape as long as it is hot. 4. Decorate the label as desired. If my records had really cool labels, I would have left them. But, at .25¢ a piece, you can't expect great design. So, I used our Get Happy papers and stickers to make fun little lables. You really shouldn't have............Anyone taking credit? 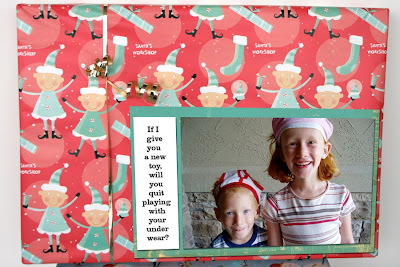 I hope each of you are having fun with our "Thrifty Gifty" approach to the holidays. Some are having maybe a little too much fun! Last week, I was out of the office on business. I stopped in on Friday, and there was a small shipping box, with no return address on the outside label. I thought to myself, someone sent me a gift. I very seldom receive gifts, so this was a treat. My mind had several ideas of what it could be. Maybe a new tie, a nice new shirt from Banana Republic, or maybe some DVDs. Not knowing where or wince it came, only peeked my curiosity more. I know that the girls in the office were probably jealous, because I received something and they didn't. Someone had went to a lot of trouble to make sure that there present to me, wouldn't get damaged. They took great care in taping the outside of the box, and packed the gift like it was porcelain China or something. 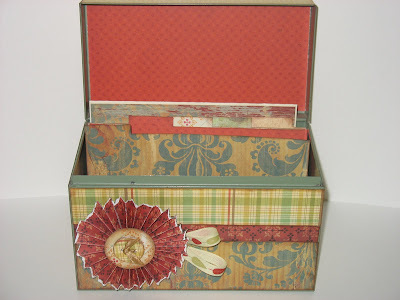 I hurried, ripped open the box, to find a cute little wooden box altered with our Wonderland Christmas paper. It was a cute little box. Very cute. I think I even caught myself cooing the words "ahhhhhh. There are just so many wonderful people in the world. I think I shed a tear. 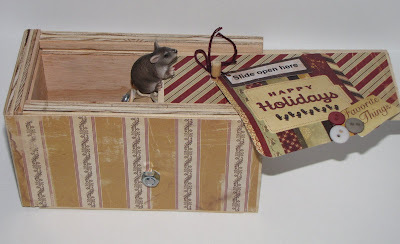 This beautiful, cute, fun, little box had a homemade very thoughtful tag attached ( with string and buttons) that said "slide open" here. Once again, no name attached. No!- You really shouldn't have............... Anyone taking credit? Congratulations Margie @ 11:16 you have undergone the humiliation of posting your teen memory to win a great prize. Send us your address and we will send you the five lines...... which no one guessed correctly by the way. They are Dutch Girl, Halfway Cafe, Mr. Campy, Hey Sugar and Gretel. Now for the Thrifty Gifty. For the cost of your time plus a blank DVD and iMovie, you can make a gift that will be remembered and cherished for years to come. 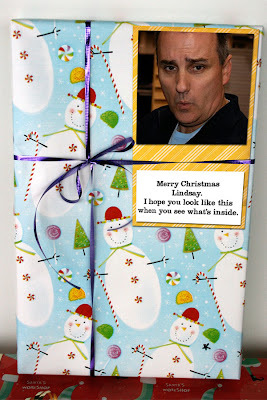 Eric and I helped Lindsay make this for his wife for Christmas last year. It was fun to see all their old photos and his wife said it was her favorite present. After you make your movie, decorate a CD cover to go with it using your stash of supplies. Good morning! My teeth are killing me, but Krista was so sweet and made a fabulous Thrifty Gifty for you all! 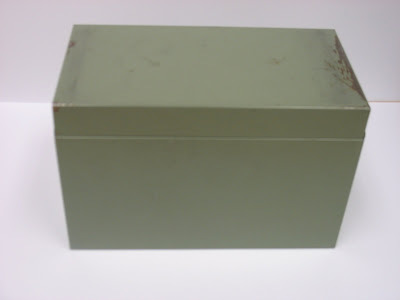 I purchased this old metal recipe box at my local thrift store for .75¢. 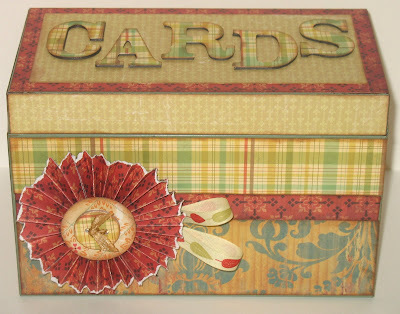 Krista made it into a card organizer. My sister in law made me a birthday calendar for Christmas last year and I think it would be great to combine these two gift ideas! 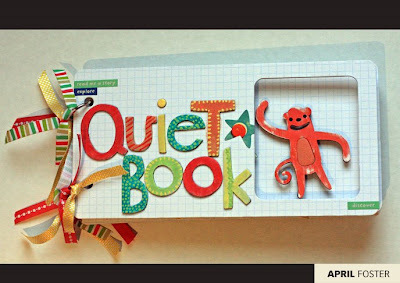 All you would need to do is have 12 dividers (one for each month) with a space for writing names and birthdays on them. You might never forget to send a card again! 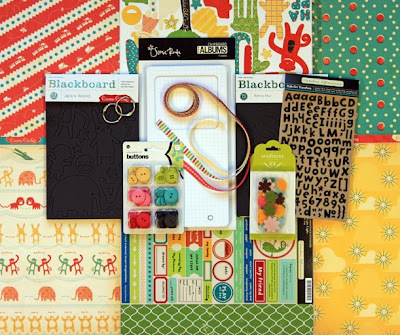 To celebrate my new braces, post a teenage memory you'd rather forget and be entered into a drawing to win a Paper Crafting Kit from each of the lines Krista used! OK, here it is. My newly tinseled smile. The close up below is probably too much information, but if you look at those bottom front teeth, you can see why I had to do this. I had dentists talking about pulling the one that is in a new row all by itself. I had other dentists say I might lose the two that have been pushed too far forward. So, I just tell myself it will all be worth it. I like my teeth. I want to keep them! And yes, that is a little spring between two of my teeth. We are separating them. They were not meant to be close friends. They should never have pushed that little tooth away. Shame on them for being so clique-ish! Now, if you would like to take your orthodontic work to a newly fashionable level, my orthodontist gives every patient a hoodie of their choice. All I can say is........ "Go Dr. Willis! Go Ortho Team!! Braces Forever!!! PS: Because it took a couple hours longer than planned to get all this hardware in my mouth, I'll be foregoing the Thrifty Gifty in place of making soup and other food that doesn't require chewing. Thanks for your understanding! The Thrifty Gifty will be delayed today. I have an appointment. Not just any appointment, but one at the orthodontist. Yes, ladies..... and any gentlemen out there........ 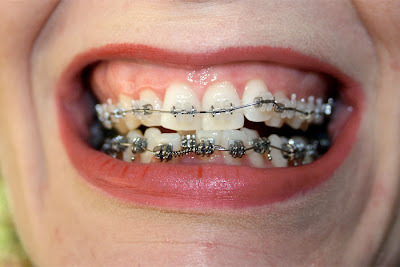 I am getting braces! Now, I have had braces before. My parents paid lots of good money to straighten out my teeth when I was young. 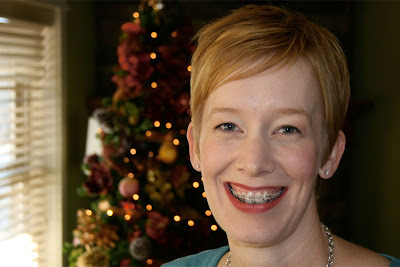 I have already gone through the humiliation of braces, elastics, a variety of retainers..... although I never had to wear a headgear. But, it was in the day, when they thought a few years with a retainer would keep everything straight. Unfortunately for me, everything is crooked again and getting worse each year. So, just in time for my family Christmas party this weekend, I get to re-live my childhood and show up with a smile that truly sparkles...... like tinsel! I'll post photos along with the Thrifty Gifty later today. HMmmmm, I wonder if Eric has ever kissed a girl with braces? I'll have to ask! Today was our Christmas party and as those of you who have followed our blog know, we have a tradition. It is the Cosmo Cricket Christmas Party Poem. Lindsay is always the author (it seems I have gotten him hooked on the pleasures of rhyming). Here is an edited version of this years poem (the edited parts required a level three security clearance, sorry). And we hired Krista and Devin. Our will, they would test. The warehouse is without Jon. It must be my fate. And love what they do. For a more spectacular crew! Hello Everyone. Hope you had a great weekend! I love the idea behind this project. I can't take credit for it though. A friend of mine, Laurie Hahn, told it to me. It is a book on tape. What is fabulous about the idea though, is that you either read a book onto tape for someone you know (child, nephew or niece, grandchild, grandparent, etc) or you send a book and tape to someone (grandparent, aunt, uncle, etc.) and have them read it onto tape and send back to you. It's a great way for long distance relatives to stay connected, which I really appreciate since I don't live close to mine or Eric's parents. You'll notice that the book in my photo is not new. 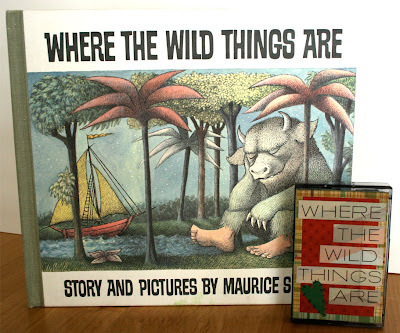 You don't need to purchase a new book, it's also really a special gift to just have someone close to a child read their favorite story on tape for them. If you have kids in elementary school, chances are you need to come up with a few teacher gifts. For me it's two this year. So, I love these decorative magnets. They turn out really cute (much nicer in real life..... 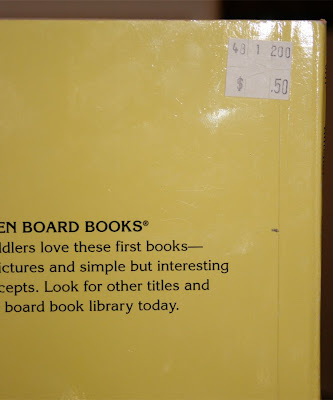 I had trouble photographing them with so much reflection off the glass) and the white boards that have replaced chalkboards in schools are magnetic so teachers have more need for magnets. Whats even better is that your kids can help you giving them a sense of pride and ownership for the gift. To make these, you need glass pebbles. These can be found at craft stores, but less expensively at dollar stores. You'll also need magnets. In my case, these were found in an 11 year old's bedroom amongst rubber bands, paperclips and more mini-flashlights than I can ever remember purchasing. To make them, simply place the pebble over the area of paper you want to cut (I thought the Jack's World line was perfect for teachers!) and pencil around it. Cut on the inside of your pencil line so that your paper is slightly smaller than the pebble. Using a clear drying adhesive, coat the right side of the paper and press onto pebble. I usually hot glue the magnets on, but I ran out of glue sticks and I'm not the type to run to the store for such a situation. I simply used super glue, which I actually found to work better. Now, for the packaging. I had to think about this for a bit. The magnets are heavy enough that I was worried I would have to use so much glue to hold them onto the card that the recipient might never get them off. What I did was to use a lower tack adhesive just so that they wouldn't slip. Then, I punched holes in a band of cardstock and wrapped it over the top and around the back. The pressure from the band, with the help of a little adhesive keeps the magnets in place, while still making them removable. Those of you who know me, know that my favorite treat of all is Hot Chocolate. There is something about the warm, dark, not too sweet, chocolaty flavor mixed with the smell of warm milk that makes me feel like all is right in the world. I don't even have to drink it, although I always do, but just holding a warm cup in my hands and smelling it makes me feel safe and secure. So, I happen to have an abundance of empty Hot Chocolate containers floating around my house. If you don't you can pick up tins at dollar stores and even less expensively at thrift stores. 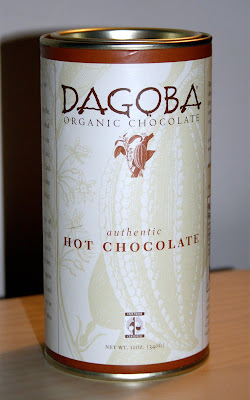 Now, I am too cheap to buy really good Hot Chocolate. I can be content with Nestles mixed with milk and warmed up in the microwave. But, many of my friends, knowing my obsession, give me cocoa mixes for gifts....... which I truly love, by the way! Once, Mike Bellande (some of you might know him) gave me a tin of Bellagio Italian Hot Chocolate. It was like drinking a brownie. It was so good in fact, that I looked for it online. As soon as I saw the price, my "frugal factor" kicked in and I went back to my Nestles! When you drink at least one cup a day you have to consider the expense! So, here's how to give your friends a tin of hot cocoa without breaking the bank! When I am not being lazy and using Nestles, I use variations of this simple recipe. CAUTION: It cannot be mixed with water! Only milk, as all hot chocolate should be made, in my opinion. Mix it together. For one serving, warm one cup of milk and add 2T of mix. Here is a popular recipe from allrecipes.com that I might try too. This one can be mixed in water, but trust me, they always taste better mixed in milk. Mix it together. Dissolve 1/3 cup cocoa mix in 1 cup boiling water. Some fun things to try when making cocoa mixes are replacing part of the sugar with candy canes or Werther's Originals that have been chopped finely in your blender or food processor. For the second recipe, you could replace the creamer with flavored varieties like hazelnut or vanilla. 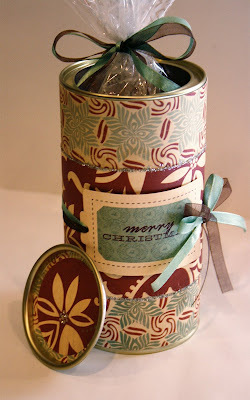 To make the tin, I covered it in Be Good "Ribbons" paper. Then I added the strip of Yultide from the Oh Joy collection around the middle. I covered the edges of the Yultide paper with a bead of glue coated in silver glitter. The tag is cut from the Oh Joy journaling cards. I love the chocolate and mint colored ribbons to go along with the cocoa theme! My canister has a set in lid that was perfect for decorating. I added a bit of glitter to it too, just for good measure! So get mixing and while you're at it, make yourself a cup. It is the closest thing to peace on earth! 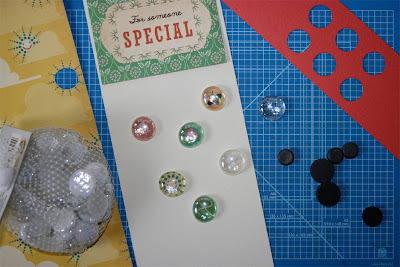 I am really excited about our Thrifty Gifty ideas. Here is the first one. If you don't have a little one to make this for, don't worry. We have ideas for almost everyone on your list! Or, if you want to do something nice, these are great for donating to Women's Shelters, children's hospitals and humanitarian organizations that send educational supplies to third world countries. 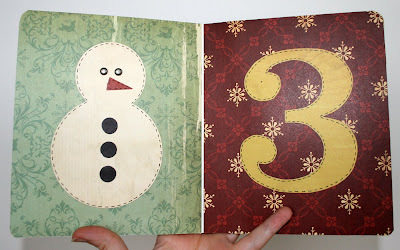 This is a fun and simple to make counting book. I tried to keep the design quick and easy so that if you decide to make these for groups of children like grandkids or nieces and nephews, they could be assembled in a jiffy! 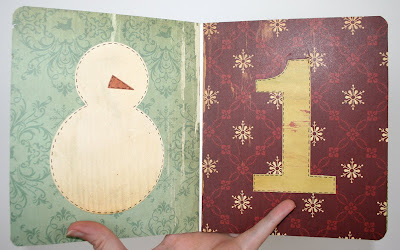 If, however, you would like a more elaborate counting book, for a little girl, check out Maren's blog (it's the Zany Not Crazy link in the right side bar). She has a super cute one! 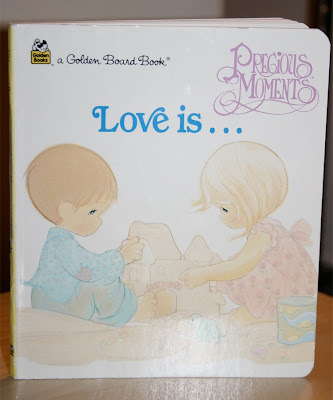 Around your house, you might have old board books that your kids no longer read. But if you're like me, you might not. So, in my case, I went to the local thrift store and picked one up for .50¢....... pretty steep, I know! Now a few things to keep in mind. Your book may have a different number of pages than mine. No problem. You can count higher by adding a scarf with 5 stripes, 6 snowflakes, etc. Or, you can do what I did. My book actually had one more page. I just glued it to the page in front making it have one less. It was easier!! 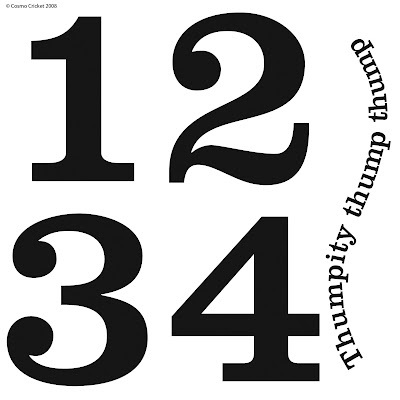 I have included a pattern for the numbers and text on the back cover. The way I did the numbers was to enlarge them to the size I liked on my computer screen. Then I used the screen as a light table, placing my cardstock over the top and tracing it right off the screen. Easy as pie! You are welcome to use my template, make copies, teach classes, whatever. Just don't make copies for sale and we will continue to be good friends! 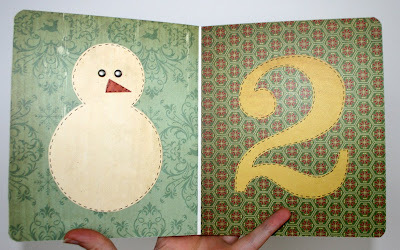 For the snowman and parts, I used the Oh Joy diecut sheet. 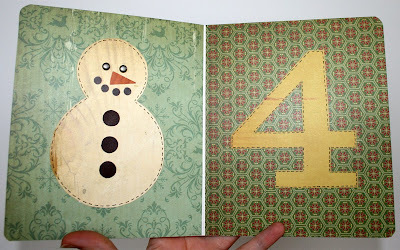 I traced the snowman onto the backside of the Mitten Mitten paper and made four total. Use one of the snowman that you traced for the first snowman since its eyes won't be diecut. Do the same thing with the buttons and noses. For the mouth I used a hole punch. We will be sending a check to Quarter's for Christmas for $359 to help buy shoes for children in need this holiday season. We hope you all had fun and that those of you who were first time posters on our blog found it to be a fun and friendly place. We appreciate all your support and wish you the best in the coming new year. I want to give a special thanks to Lindsay who thought up this fabulous idea! 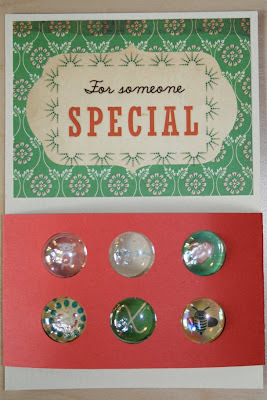 Check back tomorrow for the first Thrifty Gifty project and let the Holiday Spirit begin!!! At our church, Julie has the responsibility of spending one hour each Sunday teaching children ages 3-12 how to sing. It's actually kind of interesting, since Julie, and she would admit this, doesn't sing. She is however creative in her approach. Yesterday she put stickers all over her face, and explained to each of the children, that she had caught the Christmas spirit and warned them that it was contagious! She proceeded going around and putting stickers on the faces of all those who were singing. When church let out, the halls were filled with sticker -faced children proclaiming "That they too had caught the Christmas spirit." We decided that we wanted to kick off December right by helping each of you catch what Julie and the children had caught. Oh, don't worry, no singing required. We are asking that you and your friends leave a comment on our site. It doesn't need to be anything lengthy. It might just say "Merry Christmas", Or "this one's for the kids." It may contain a Christmas wish. For every person who comments between now and 5:00PM MST December 2nd, Cosmo Cricket will donate $1.00 to "Quarters for Christmas" a non-profit organization, that provides shoes for needy children. During the rest of the month we will be showing on our blog, great gifts that you can make from recycled, inexpensive items, that you might have laying around your house, or that you could find at your local thrift store. Were calling this "Thrifty Gifty". It should be fun and give you some terrific ideas for great gifts that you don't have to spend a ton of money on. The clock started ticking................................................................................ now!